Kidder was exposed to archaeological literature early in his life, as he grew up around anthropology and archaeology publications in his father's library. Works he enjoyed reading included those of anthropologist and social theorist Lewis Henry Morgan, about pre-historic Native Americans. Growing up in Michigan, his father took Kidder and his brothers on frequent backwoods trips where he learned the essentials of being an outdoorsman that would help him later in his life. His first writing was actually published when he was fifteen, on the topic of ornithology. The 1901 article was titled "A Bittern at Close Range" in Bird-Lore magazine, now known as Audubon. While Kidder enrolled at Harvard with the original intention of becoming a physician, his turn to archaeology began when he selected Harvard's "Archaeology 5" course as an elective, but also when he discovered his distaste for math and chemistry courses, as seen in his unpublished memoirs.2 His career jump-started when he took summer work in archaeological survey in 1907. Kidder's professional career in archaeology began when when he took a summer job working in archaeological survey in 1907. Found through a posting made by Dr. Alfred Tozzer in the Harvard Crimson, he set out to travel west. Although he had studied in Switzerland when he was younger, the trip was his first west of Chicago, and incredibly exciting for him as a lone traveler. He traveled west alone and met the rest of the group in Bluff, Utah the first day of July. The project was led by "Mister" Edgar Hewett, who led simply by leaving Kidder and fellow Harvard students Sylvanus Morley and John Fletcher alone for the month of July to conduct their own surveys of the land. Hewett provided incredibly little guidance to the group, and Morley, with the most experience, the rest having none, took lead of the group. Since Harvard provided no formal archaeological field training, this challenged Kidder to begin the process of creating his own methodology in survey. While staying the Holley family ranch, they mapped and measured many ruins of the McElmo and Yellow Jacket regions. When Hewett returned to them late July, the group traveled to Mesa Verde area, then on south to New Mexico. It was at the Puye site that Kidder had his first experience with archaeological excavation. Image 2 A picture of Sylvanus Morley, called "Vay" in Kidder's diaries. Morley and Kidder worked together on Kidder's first archaeological field trip and the two would share work in the Maya regions later. Throughout his trip, Kidder kept a journal that displayed his endless curiosity. His work in the McElmo and Puye regions ignited his deep interest in Southwestern pottery. Later, one of the most important contributions Kidder would make to American archaeology was his use of ceramic evidence in identifying various archaeological cultures in the Southwest. Through his experience in 1907, in addition to the skills he learned in field archaeology and archaeology survey, he became aware of the importance of pottery in the identification of cultural variations and cultural chronology. Kidder returned to the Southwest with Morley next summer, after his graduation in 1908, sponsored by the Archaeological Institute of America and the University of Utah. He worked with Sylavanus Morley again, and the two had become good friends. Image 3 This is a figure taken directly from Kidder's own report on the Pecos Region entitled "An Introduction To The Study Of Southwestern Archaeology With A Preliminary Account Of The Excavations At Pecos," published in 1962. Presumably drawn by Kidder himself, he uses the map to show the approximate limits of the Pueblo influence which he studied. This cited passage directly from Kidder's work provides direct insight into his framework of study. Kidder's first trip to the Maya region was in 1926 to Coba, Quintana Roo, in Mexico's Yucatan Peninsula, then made his first trip to Uaxactun, in the present-day area of Peten, Guatamala, in 1928. To make the journey he had traveled by boat and muleback, recanting in his introduction to A.L. Smith's publication on the Uaxactun, Guatemala excavations of 1931-1937. Kidder remarked at the experience, "to one brought up in the clean, open pinewoods of northern Michigan, whose field work had all been in the semi-deserts of Arizona and New Mexico, it was strangely awesome." With the development of technology, Kidder's adventure was not over. In 1929, Colonel Charles A. Lindbergh, the famous pilot who had successfully navigated the first solo flight over the Atlantic Ocean from New York to Paris, offered Kidder his help. On plane rides over the area, Kidder and a fellow archaeologist tested out the feasibility of finding sites and plotting geographical features from the air. Modernly, it could be said that Kidder was one of the first to use remote sensing tools to conduct his research. Image 4 Kidder and friends trenching walls in Pecos 1920. Through his body of work spanning both the North American Southwest and Mesoamerica, Kidder was truly an Americanist archaeologist. Kidder was one of the first archaeologists to bring in a team of multi-vocational specialists to help him with his work. He used what he dubbed a "pan-scientific attack", where he would recruit the help of experts from different areas to help analyze sites. The variety of knowledge on his team would give them special insight on archaeological problems. While his work in the Pecos region inspired the idea of a multifunctional team, his use of this can be easily seen in his Maya initiative as the director of Carnegie Institution's Maya Program. He aspired in the use of the Institutions resources to seek out geneticists, zoologists, botanists, ethnologists, physcicians, and so on to assist in archaeological analysis.3 His program was not free from criticism by colleagues, and the logistics of bringing together such a variety of scholars to work on single portions of a project proved difficult. 2 When speaking about his administration with younger students, Kidder was humble, simply mentioning, "as you know, I have been heavily criticized for this. "7 However, the notion of his pan-scientific approach and venture into genred archaeology is applaudable. Along with the Alfred Vincent Kidder Award, a living legacy of Kidder includes the Pecos Conference, which still takes place every year, and of 2016 even has a Facebook event. Kidder started the first Pecos Conference in 1927 as a way for archaeologists in the Pecos area to meet and share ideas. Before this, archaeologists mostly worked in solitary groups, but the conference enabled the groups to share ideas. From Richard Woodbury, it can be said that the first Pecos conference in 1927 even provided indication of an interest in cultural resource management, where Frank Pinkley led a discussion of the problems of work on public lands, the threat of unauthorized digging, and relationships between field workers and National Park Service Personnel.2 Another important point to make about the Pecos Conference and Kidder's Pecos work in general has to do with the continuation of his work developing field strategy. 3 He seldom worked as a professor except as a Teaching Fellow as a graduate student at Harvard and one semester at the University of California Berkeley in spring of 1951, however Kidder was always active in teaching younger archaeologists and the Pecos field camp was essential in the development of the new leaders in the field of archaeology years later. Although informal, Kidder would join seminars and guest lecture in courses. 7 Kidder has reflected himself on the lack of training he received as a starting archaeology, and with the Pecos Conference and his openness to teaching new archaeologists, he encouraged communication and the disemmination of information to create a more cohesive archaeology in the Southwest. The Pecos Conference add to his legacy of humility and eagerness to spread his own passion of archaeology. Givens, Douglas Randall. 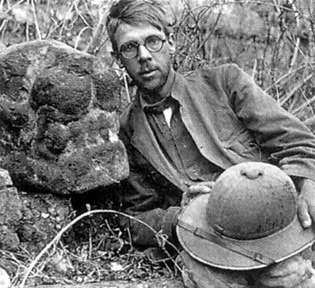 "ALFRED VINCENT KIDDER AND THE DEVELOPMENT OF AMERICANIST ARCHAEOLOGY. (VOLUMES I AND II) (STRATIGRAPHY, PECOS)." Order No. 8704936 Washington University, 1986. Ann Arbor: ProQuest. Web. 4 May 2016. 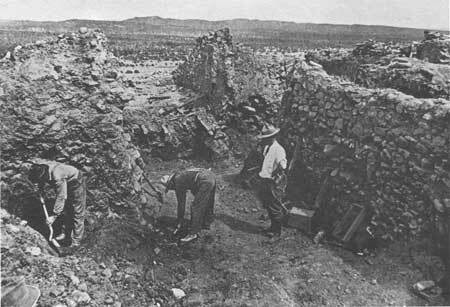 Kidder, Alfred Vincent, and Robert S. Peabody Foundation for Archaeology. An Introduction to the Study of Southwestern Archaeology: With a Preliminary Account of the Excavations at Pecos. no. 1. Vol. New Haven: Pub. for the Department of Archaeology, Phillips Academy, Andover, Mass, 1924. Web.